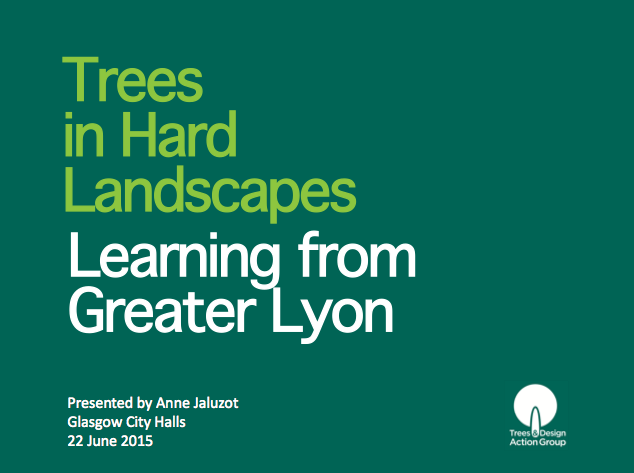 The Better places, better infrastructure, better lives: Delivering real value with urban trees seminars held on 22 and 23 June 2015 in Glasgow and Edinburgh were TDAG's first training events in Scotland. Organised in collaboration with a wide consortium of partners and sponsors (listed at the bottom of this page), these events attracted over 160 delegates from wide ranging professional backgrounds including civil and highway engineers, town planners, urban designers, landscape architects, architects, economic regeneration specialists and urban forestry specialists. Based upon Trees in Hard Landscapes: A Guide for Delivery, TDAG’s latest publication, the seminars featured a rich selection of speakers from coming from the US, Sweden, France, Scotland and elsewhere with insightful expertise in using of trees for enhancing infrastructure resilience and performance while creating places that work for people, businesses and the planet. Discussions explored some of the next steps each participant could take to build upon these ideas and examples within their own day-to-day work, emulating the principles that everyone can make a difference and that being successful at changing others often requires changing oneself first. There was a great appetite among attendees to be able to access after the events the conference presentations materials and the references that came up during exchanges. These are provided below, alongside with videos of some of the talks that were recorded in Edinburgh. Enjoy! Dr Kathleen Wolf and Björn Embrén were the two international speakers featured in the programme. 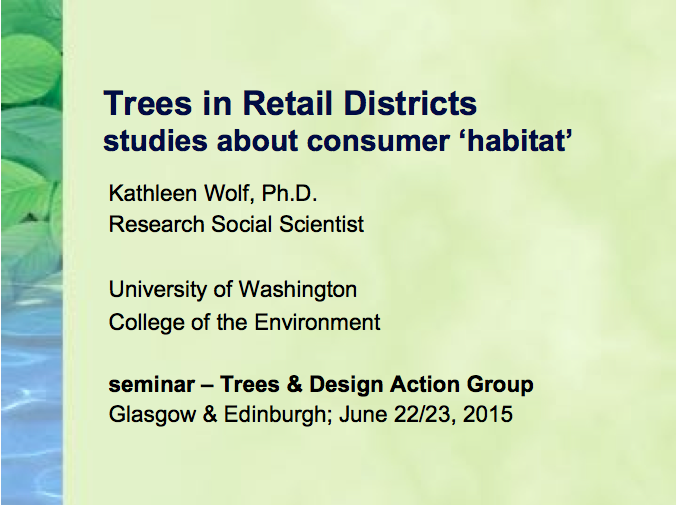 Dr Kathleen Wolf gave a two-part presentation delving into the latest research findings available on the impacts of urban trees on people's health (Part 1) and on shopping districts (Part 2). Björn Embrén, arboricultural manager for the Municipality of Stockholm, presented the award-winning 'Stockholm Solution' to cost effectively scaling-up sustainable drainage solutions, reducing waste, providing renewable energy, and facilitate community participation while achieving healthy and lasting growth for urban trees in hard landscapes. A PDF copy of their presentations can be downloaded below. Speakers bios can also be found below. 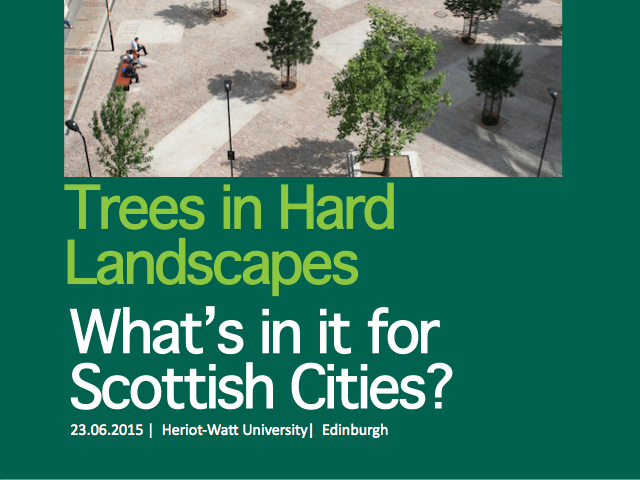 Trees in Hard Landscapes: what's in it for Scottish cities? Implementing Designing Streets – with trees! Jeremy started his career working for the Forestry Commission in 1978, establishing his own tree contracting business in 1980. Fifteen years later he started Barrell Tree Consultancy, which is now one of the UK’s largest tree consultancies, based in southern England. He heads a team of six consultants specialising in the legal and planning aspects of urban tree management. Jeremy is a prolific public speaker and has authored numerous papers and articles on tree management. Jeremy is an accomplished expert witness in the field of risk management, focused on using his extensive practical background to bring a common sense perspective to providing expert evidence. He was one of the first practitioners to voice concern in 2007 that UK urban canopy cover was declining, subsequently working to identify the causes and promote solutions for reversing that trend. Bailie Cameron assumed her current role as Executive Member of Glasgow City Council's Development and Regeneration Services in June 2010. Her remit in Development and Regeneration Services is extremely wide, encompassing Housing Regeneration, City Planning, Sustainability, Creative Industries and, crucially Economic Regeneration and Social Initiatives. She is the Council Member of the Board of Glasgow Housing Association, Chair of Canal Regeneration Board and Chair of the Citywide Housing Forum. She is also Chair of Transforming Communities Glasgow and the Champion of Glasgow’s Green Year 2015. Alison is a chartered Landscape Architect with experience of management, design and delivery of a range of rural and urban projects applying the principles of sustainable design, good place-making and the implementation of green networks. She has worked on a range of natural and built environment projects with organisations such as local communities, housing associations, private landowners, local authorities and government departments. These projects include masterplanning, open space assessment and strategy, residential development, urban regeneration, educational campus, streetscape, urban parks, habitat restoration and flood defence schemes. Alison is the partnership manager of the Lothians & Fife Green Network Partnership, promoting green networks in the Lothians & Fife, delivering economic, social & ecological benefits in partnership, as part of the Central Scotland Green Network. Björn was initially trained in horticulture in the mid-seventies and has since acquired a wide ranging practical experience in the private and public sectors of gardening and plant care in the Stockholm area. 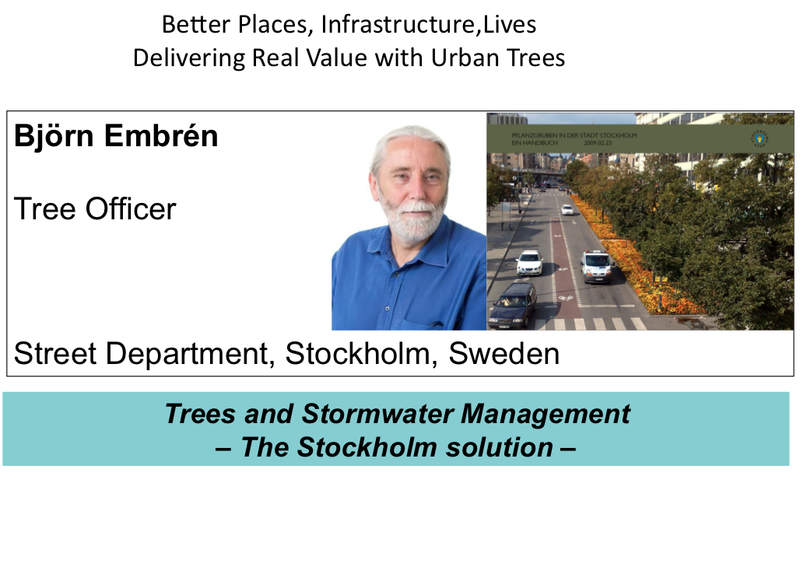 As the arboricultural manager for the Municipality of Stockholm's Highways Department, his primary focus over the past 12 years has been the establishment and maintenance of public plantations of perennial plants and trees. Björn has lead the development and successful implementation of what has become known as 'the Stockholm System' - an innovative design for growing trees in hard landscapes providing excellent load-bearing capacity for street users and facilitating stormwater run-off management while providing a well-oxygenated, nutrient-rich and non-compacted growing environment for tree roots. His approach is captured in ‘Planting Beds in the City of Stockhom: A Handbook’, which Björn co-authored in 2009. Björn's recent work on improving the 'Stockholm System' has led to a growing integration of biochar. This innovation was at the heart of the Municipality of Stockholm's 'Biochar - for a Better City Ecosystem' entry to the 2014 Bloomberg Philantropies' Mayors Challenge, which was rewarded with a €1,000,000 Innovation Prize for implementation. David is a Senior Associate at Grant Associates, joining in 2003. David’s interest is in a design-led approach to landscape design that integrates landscape, architecture and engineering to create distinctive, productive and beautiful places that people cherish. David has been involved in all scales of development from sustainable new towns within the tropics and master planning a garden settlement in Surrey, to small scale courtyard and garden design. During this time David has worked on a number of award winning projects such as New Islington, Manchester, designing the key areas of public realm and infrastructure. David was the team leader for the Main Gardens at Gardens by the Bay, Marina South in Singapore. 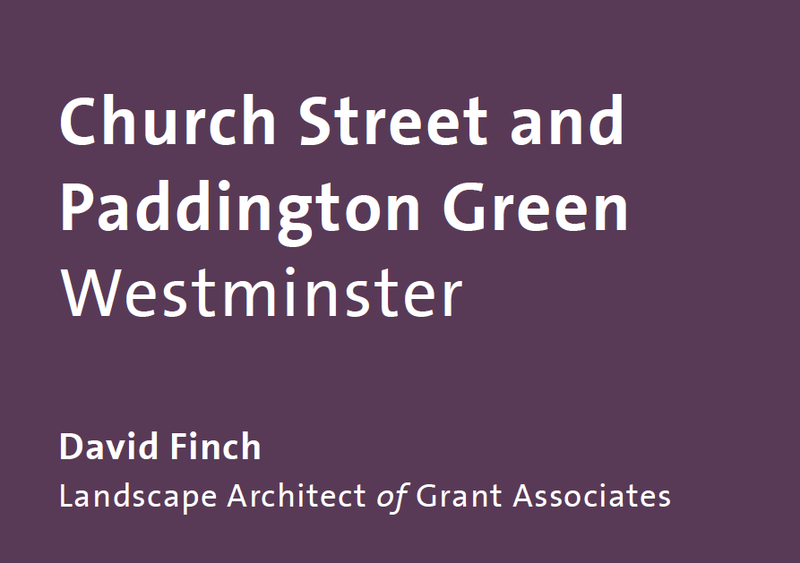 Most recently David was the design team leader for the multidisciplinary team commissioned by Westminster City Council to develop the Church Street and Paddington Green Infrastructure and Public Realm Plan. This study was described by Westminster City Council as ‘our first holistic area-wide plan to retrofit climate change adapted public realm’. The project won the Neighbourhood Planning category at the Landscape Institute Awards 2014. Having been dedicated to a career in the world of forestry, landscape and arboriculture for over 30 years Martin has attained a wealth of experience from his work in both the public and private sectors of these disciplines in the UK and overseas. Specialising in the integration of green infrastructure within in the built environment, his consultancy practice, Consulting with Trees Ltd. is at the forefront of innovative design and working practices that facilitate effective establishment and compatible longevity of trees in the urban environment. Promoting his industry and improving professionalism within it is at the heart of Martin’s work. His achievements include; working with TDAG developing best practice guidance documents, establishing the first Tree Warden scheme in Oxfordshire and the launch of the South Oxfordshire Arboricultural Industry Forum. Most recently Martin has become a founding trustee of the charity Fund4Trees which seeks to raise funds for tree related research and educational material. Martin is a Chartered Forester and Fellow of the Arboricultural Association. Nick became the representative for Leith Walk Ward in 2012. He is the Chair of Edinburgh Living Landscape, a partnership project between the Scottish Wildlife Trust, City of Edinburgh Council, Edinburgh and Lothians Greenspace Trust, GREENSURGE and the Royal Botanic Garden Edinburgh to bring a transformational change to the city’s urban environment. The goal is to create a city fit for the future with healthy and beautiful areas that are resilient to climate change as well as being highly valued and accessible to Edinburgh’s citizens. ‘Tree Time Edinburgh’ is part of this initiative. Anne is an urban planner, with 13 years of experience primarily gathered in the US and the UK in environmentally led approaches to urban policy, design and regeneration. She has worked for the City of Chicago supporting the development, implementation and monitoring of the City’s innovative urban greening programmes. In the UK, as part of the Commission for Architecture and the Built Environment (CABE), she has led CABE Space’s input into a wide range of local green infrastructure planning initiatives and associated national knowledge building and policy efforts. Anne now works as an independent consultant continuing to advise on, assess, facilitate or lead the development of tools, strategies, projects and knowledge on urban greening. This brought her to conduct the research and writing of the Trees and Design Action Group (TDAG)’s two latest publications: Trees in the Townscape: A Guide for Decision Makers (2012) and Trees in Hard Landscapes: A Guide for Delivery (2014) – two action-oriented urban forestry best practice guides on using trees in 21st century cities. Professor Jowitt, is a civil engineer, Professor of Civil Engineering Systems at Heriot Watt University, and executive director of the Scottish Institute of Sustainable Technology (SISTech). He graduated from Imperial College in 1972, and was a Lecturer there from 1974 until he moved to Heriot Watt in 1987, becoming Head of Civil and Offshore Engineering from 1989 to 1999. In 1997 he was an Erskine Fellow at the University of Canterbury, New Zealand, where he still has strong connections with the engineering community. He was elected a Fellow of the Royal Society of Edinburgh in 2005. Paul's major interests are sustainable development and systems-level solutions in engineering and the environment, particularly in water resources, risk-based asset management and water distribution systems. 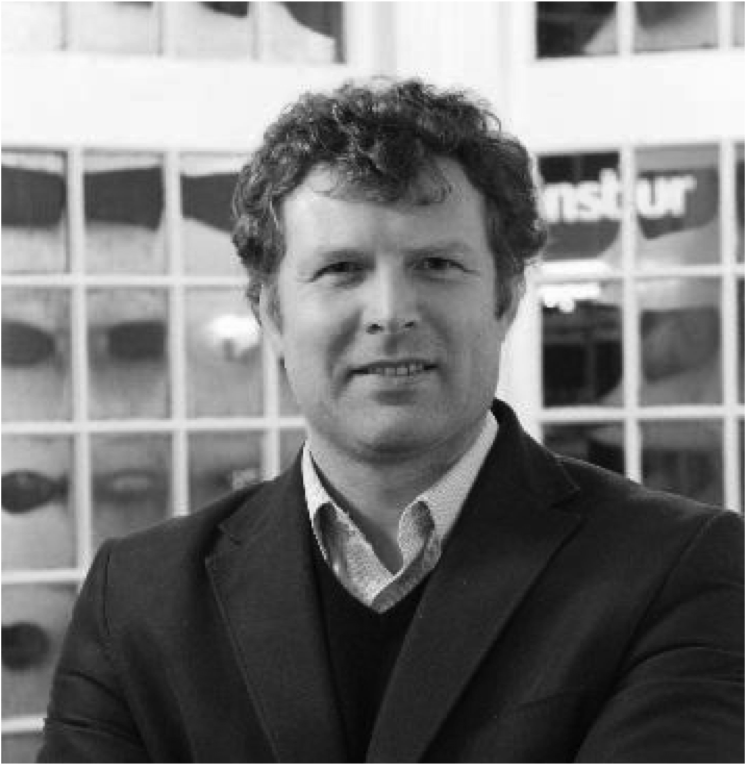 Daniel is an Urbanist, Geographer, and Chartered Landscape Architect with over 20 years experience in the private and public sectors on a wide variety of complex projects, involving urban design, community planning, town centre management, and the governance of place-making. Following being Principal Regeneration Oﬃcer in the Economic Development and Regeneration Section of East Renfrewshire Council’s Environment Department, Daniel now leads his own practice, Daniel McKendry Consulting, working with Scotland’s Towns Partnership, BIDsScotland, Scottish Council for Development & Industry, Development Trust Association, Neilston Development Trust, Scottish Government and Local Authorities. Capacity building, stimulating collaboration and creating the conditions where self-sustaining change can occur in a place-making context are some of Daniel's current major areas of interest. Allison is a Landscape Architect with South Tyneside Council working within a multi-disciplinary department to deliver streetscape improvements across the borough. Allison studied at Leeds Metropolitan University (BA Hons & Post Grad Diploma in Landscape) and became a Chartered Landscape Architect in 2009. Since 2011 Allison has been involved in the design and delivery of the Ocean Road Scheme; refurbishment of a busy shop front lined street to include an avenue of 58 long lasting trees. The scheme is featured as a case study within Trees in Hard Landscapes: A Guide for Delivery (2014) and has employed a range of tree planting techniques across the site. 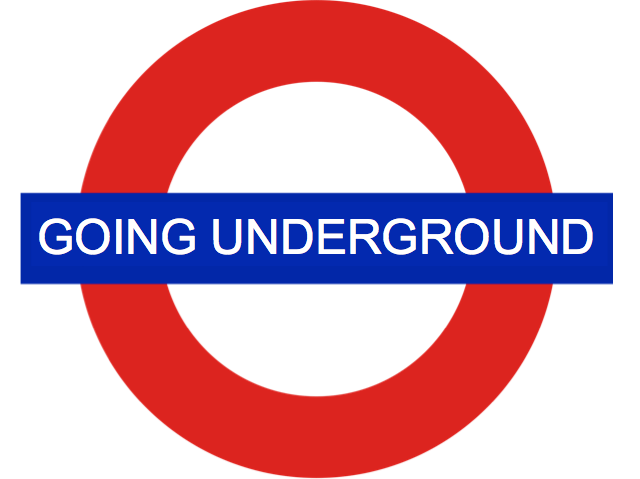 Previously a shareholding director at Stockley, Stephen was one of the founding directors of Civic Engineers in 2009. This practice has since completed and continues to deliver high quality civil, structural and urban infrastructure projects. Stephen has a passion for and a belief in the importance of public realm and place making, using design techniques and methods that rely on showcasing the prevailing character, culture and geography of the existing landscape and place, changing how people respond and engage with spaces. Stephen became a fellow of the Institute of Civil Engineers in 2013 and a Member of the CIHT in 2014. In 2014 Stephen led on the Practice’s appointment to the GLA’s Specialist Assistance Team, which was assembled to help London authorities shape and inform funding bids for capital projects particularly high street regeneration schemes. Stephen was appointed as a member to Architecture and Design Scotland Design Forum Panel in 2014. Lisa joined the Project Management and Design (PM&D) team within Glasgow City Council's Development & Regeneration Services (DRS) in early 2013 to help develop the masterplan for Sighthill, the largest of eight Transformation Regeneration Areas (TRAs) in Glasgow. From there Lisa has taken a key role in the project management, overseeing the co-ordination of the various development workstreams. Prior to joining DRS/PM&D, Lisa worked with the renowned design firm RMJM, for six years. During this time she was involved in number of urban regeneration projects, from feasibility studies to site delivery, for projects based in Scotland and Kazakhstan. The most notable projects including the ‘2014 Commonwealth Games, Athletes Village, Glasgow’ and ‘Laurieston TRA’ Glasgow. In each Lisa was instrumental in driving the project from a masterplan vision into a final design. Prior to her time at RMJM, Lisa has been involved in other residential led masterplan projects in both Glasgow and Australia: with Anderson Bell Christie in Glasgow, BN Design in Sydney and Lyons Architects in Melbourne. Iain is the Partnerships Director with the Peel Group, delivering a diverse range of development and regeneration projects, including the Wirral Waters Scheme scheme which aims to bring to Birkenhead’s derelict docklands 420,000 sqft of new office space, some goods handling facilities, and 13,000 new residential units alongside leisure and retail facilities. Over1,200 trees along 10km of streets and green spaces have been planted within and around the Wirral Water area in advance of new developments to create the right settings for investment. Iain joined the Peel Group in 2007 from a career in the third sector focused on environmental regeneration and advocacy and works to promote collaboration between public sector partners on key strategic initiatives such as Wirral Waters. He is also Chair of the North West Forestry and Woodlands Advisory Committee and is a trustee of Groundwork West Lancashire, Cheshire and Merseyside. Dr Wolf is a Research Social Scientist at the College of the Environment, University of Washington, and does research that integrates landscape design and environmental psychology. She has a joint appointment with the U.S. Forest Service PNW Research Station to help develop a program on Urban Natural Resources Stewardship. She has worked professionally as both a landscape architect and as an environmental planner. Since receiving her Ph.D. from the University of Michigan, Dr. Wolf has done research to better understand the human dimensions of urban forestry and urban ecosystems. 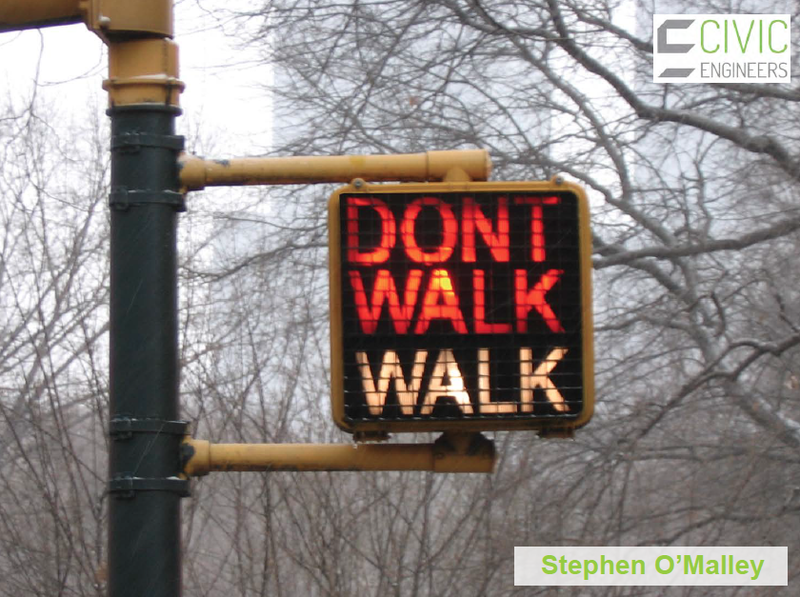 Wolf's professional mission is to discover, understand, and communicate human behavior and benefits, as people experience nature in urban settings. Moreover, she is interested in how scientific information can be integrated into local government policy and planning. She is a member of or has advised the Environmental Design Research Association, the International Society of Arboriculture, the Transportation Research Board national committee on Landscape and Environment, the Washington State Community Forestry Council, and the Tariq Khamisa Foundation (TKF). Dr. Wolf has presented her research throughout the United States, in Canada, Europe, Australia, and Japan. An overview of Dr. Wolf's research programs can be found at www.naturewithin.info; additional research findings on Green Cities: Good Health.